The last time I was at the Globe (for Henry V), I made the mistake of mentioning that I had never actually been rained on whilst being a groundling. This time round, for the opening night of Richard III, we made it to the second half quite dry but then the heavens opened and I was forced to use my delightful yellow poncho whilst proved little respite against a rather heavy and sustained fall of rain which made me long for the hard comfort of the Globe’s (covered) seating. 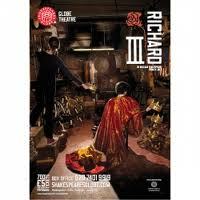 This Richard III is notable for seeing the return of Mark Rylance to the theatre where he was Artistic Director for 10 years where this all-male Original Practices-exploring company will also take on Twelfth Night later in the season and then transfer both to the West End. Given the tragic news just last week of the death of his stepdaughter, it is hard to know what to say or how to pitch any comments about Rylance. Though it is probably close to heretical to admit it, I’m not actually that big a fan of him as an actor, having found him too dominant a presence on stages before for my liking at least, but given that for once this is actually a play where that is the intention, I was willing to give this a try. Using the types of costumes and props that would have been available in 1593, Rylance sports a false arm complete with teeny withered hand (I jested at the interval that this is him saying ‘look, I can even do Shakespeare with one arm behind my back…’) and a rather muted demeanour as he limps and shuffles around the stage. His delivery prevails to the free-flowing conversational, almost stream-of-consciousness at times, which made it a different choice. It was one that took some getting used to, many in the audience found it extremely comical which jarred a little, and didn’t really convey the controlled deviousness one might have expected. But he does have a good line in crowd-whipping antics to shore up support for his coronation and brings the right note of irascible anger that flips on a dime. One can’t begin to imagine the herculean effort it must have taken to get through this week and any stutters and hesitations that there may have been – which given the style of delivery I’m not entirely sure weren’t all deliberate – can easily be forgiven. But it isn’t a one-man show by any means and there’s much interesting work around him in which some elements work beautifully. Liam Brennan’s Clarence is just masterful, exquisitely spoken and adroitly judged in his earnestness; Samuel Barnett’s measured Queen Elizabeth is a tightly controlled ball of seething emotion which erupts memorably at an intriguing moment, and John Paul Connelly and Jethro Skinner make an entertaining pair of murderers. I also liked the casting of the more-or-less appropriately youthful Lorenzo Allchurch/Dylan Standen as the Duke of York and Austin Moulton/Shanu Hazzan as the Prince of Wales (not sure who we got) though someone should have a word with Barnett about the clothes picked for his young princes. Elsewhere choices weren’t quite as strong: Johnny Flynn’s Lady Anne feels really uncomfortable in his vocal delivery and carriage, Paul Chahidi’s Tyrell is nowhere near malevolent enough and Colin Hurley’s wheezing King Edward feels overdone. And with the excision of the role of Margaret (though some of her lines are incorporated elsewhere, Elizabeth gets some in the second half for instance), there’s not quite the sense of impending doom, of cursed darkness stealing into Richard’s hermetic world and foretelling his downfall. Part of this comes from the audience’s willingness to laugh at almost anything regardless of what is actually meant, but also from Carroll’s direction which I think needs to rein in some of this broadness. Globe productions are what they are though, the sense of humour here will always be different to mine, and this is undoubtedly a Richard III which feels suited to the space. For me this doesn’t come anywhere near to Propeller’s incendiary reinterpretation of the play – but then I suspect nothing ever will – and this also lacks the fierceness of all the women that the Bridge Project brought across so powerfully. That said, aspects of my misgivings could well improve and indeed some might be fine with it as it is, and Rylance’s performance will undoubtedly mature as time passes to make this a hot ticket in a damp summer. Saw it last night – quite the worst thing I've seen at the Globe. Terribly cast, with Rylance being quite unconvincing as anyone capable of usurping the throne. The female roles were all quite shockingly badly done – an amateur production would have been embarrassed by them. Just all round awful.